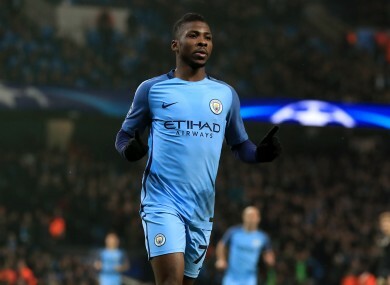 Kelechi Iheanacho looks set for a move to the Foxes. Kelechi Iheanacho could be set to join Leicester. LEICESTER CITY ARE close to signing Man City youngster Kelechi Iheanacho, according to the BBC. Meanwhile, Goal report that West Ham have pulled out of a move for the player under the instruction of manager Slaven Bilic, after co-chairman David Sullivan had agreed a deal in principle with the Etihad outfit. Arsenal fear they could be forced to sell Alexis Sanchez to Man City, with the Chile international understood to be eager to link up with Pep Guardiola, who previously signed him from Udinese during his stint as Barcelona manager, though Inter are also believed to be keen on the 28-year-old. Meanwhile, Stoke are hopeful of landing out-of-favour Man City midfielder Fabian Delph. Wayne Rooney will not be used as part exchange by Man United in their attempts to sign Everton’s Romelu Lukaku, while the Belgian international has reportedly agreed a £250,000-a-week contract. Chelsea are understood to have targeted 32-year-old Swansea striker Fernando Llorente, after failing in their attempts to sign the Spaniard on loan last January. The Welsh side also face a fight to keep hold of Gylfi Sigurdsson, with Everton set to bid €36 million for the former Tottenham player. Leicester and Arsenal’s valuation of Riyad Mahrez remains a long way apart, with the Foxes wanting €56.5 million for the unhappy star, while the Gunners are only willing to pay €39.5 million. Barcelona’s €25 million bid for former Spurs midfielder Paulinho has been rejected by Chinese side Guangzhou Evergrande. Finnan joined Liverpool from Fulham for a fee of £3.5 million. The Limerick native had previously rose through England’s lower leagues, starting out at Welling United, prior to stints at Birmingham, Notts County and Fulham, making over 200 appearances for the latter. Before joining Liverpool, Finnan was already an established Premier League player, featuring in the 2000-01 PFA Team of the Year. Signed by Gerard Houllier, the Irish star subsequently experienced an injury-interrupted first season at Anfield. By the time he recovered his fitness, Rafa Benitez had taken charge at Anfield, and Finnan was forced to fight for his place, eventually making the right-back slot his own despite competition from new Spanish signing Josemi. Capped 53 times by Ireland, Finnan won the FA Cup with Liverpool in 2006, also playing an integral role in their successful 2005 Champions League campaign, despite going off injured at half-time in the famous final against Milan. After 217 appearances in total for the Reds, he had short spells at Espanyol and Portsmouth before retiring in 2010, with his last game being Pompey’s 1-0 loss to Chelsea in the 2010 FA Cup final. Now 41, he works in property development in London. The former full-back also briefly came back into the news in 2015. He was the only player that organisers of Liverpool’s 2005 Champions League reunion could not locate, but after a Twitter campaign, he was contacted by the Liverpool Echo and confirmed his regret at missing the event. Email “Man City starlet set for €28 million Leicester move, Alexis' exit strategy and all today's transfer gossip”. Feedback on “Man City starlet set for €28 million Leicester move, Alexis' exit strategy and all today's transfer gossip”.